A crucial ingredient to e-learning success is setting objectives for your training course. In fact, you should set objectives before you do any other planning for the course. After all, you must know where you want to get to, so the course delivers on your requirements. What about the other end of the process, however. How do you measure e-learning return on investment and how do you track success? This part of the process is as important as taking steps to learn what worked with the course and what didn’t. After all, without this information, you won’t be able to make improvements for your future training and e-learning course development efforts. 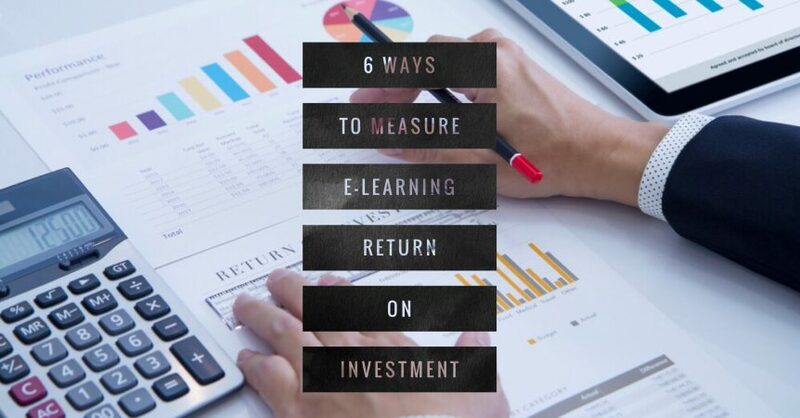 So, here are six methods for measuring e-learning return on investment. This is the most obvious and, in many respects, the simplest method. It involves simply getting learners to complete a quiz or assessment at the end of the course to check how much knowledge they retain. It can also be helpful to do another assessment further into the future, so you get an idea of longer-term knowledge retention. While doing assessments won’t tell you everything you need to know, they are beneficial for measuring success. Assessments have other benefits too. For example, you can also use them to guide learners on where they should focus future training to improve their knowledge and fill any skills gaps that exist. Measuring performance is another common method for analysing the success of an e-learning course. You could measure sales performance in your Dubai office, for example, where an increase in sales demonstrates the success of the course. Another example is driver training where the objective is to get your team to drive more efficiently to reduce fuel costs. The performance improvement with this e-learning course would, therefore, be reduced fuel expenses in your fleet. As with all the methods on this list, performance improvement is not definitive. Take sales as an example – there are a lot of factors that can impact an improvement in sales. Therefore, attributing a percentage of that improvement to an e-learning course is normally completely subjective. That said, performance improvement is a very useful tool for measuring e-learning success. This method only applies if achieving compliance goals is your primary objective, but it is very useful when this is the case. Successfully completing compliance training with each person on your team could the goal itself, or you might use something more tangible. An example of the latter is reducing accident rates or improving near miss reporting rates if the e-learning is on a health and safety topic. Simply reducing the cost of training in your business is another effective way of measuring return on investment, particularly when the training is compulsory. To get the most out of this method, you should combine it with one of the other options. In other words, reducing the cost of training while also achieving another objective, such as delivering on your compliance goals. This is another success-measuring method that is particularly useful when the training is compulsory, regardless of the method of delivery, although it can be a helpful measurement whatever type of training you are delivering. There are lots of ways you can use this measurement as well. For example, you can include a feedback survey in an HR onboarding course that you get new employees to complete. Generally speaking, these types of courses can be dull and boring which is why many businesses decide to use e-learning as the method of delivery to make them more fun and engaging. Getting direct feedback from learners will give you this information. Another example is through customer feedback where the training is on a customer service topic. As above, lots of things can impact the customer service performance of your business, but you should be able to tailor the feedback questionnaire, so you get valuable information on whether the e-learning course delivered as you anticipated. Measuring behaviour change usually involves getting feedback from managers and supervisors. We can use health and safety training as the example in this situation again. This could apply where the objective of the training is to implement a new health and safety procedure that involves employees doing things differently. Feedback from managers and supervisors who can observe these behavioural changes will help you measure the success of the training and analyse return on investment. The method you use for measuring e-learning return on investment will depend on your business, the topic of the training, and your objectives. You may even need to use multiple methods, although the specific method you use is not as important as taking practical steps to measure success.